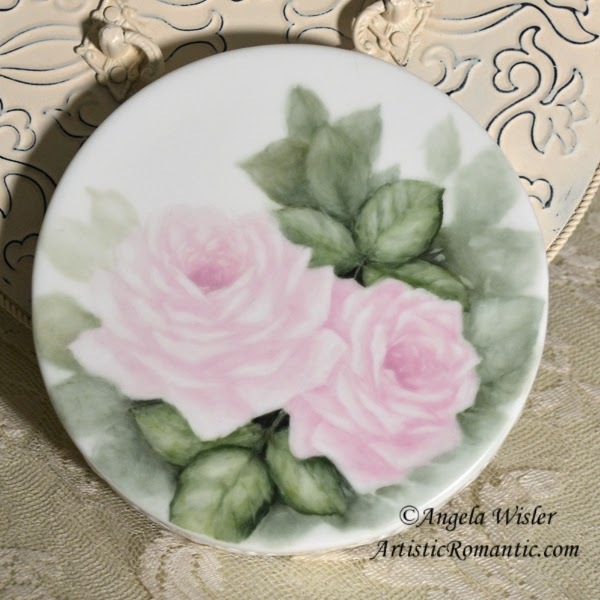 Hello, I invite you to join me as I complete a painting on a porcelain tea trivet with pink roses. 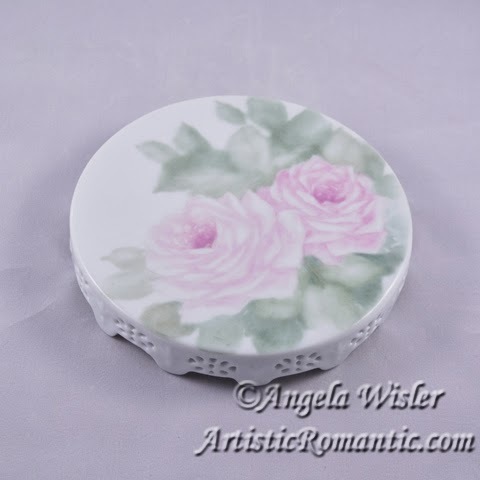 I will be using the same china blank as the violets tea trivet that is in my shop. 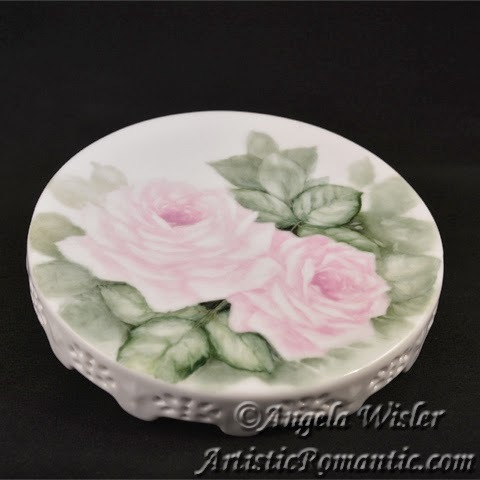 I want to paint two pink roses with a predominately blue-green background. I am thinking this piece will require four firings in my kiln, but we won't know for sure until we get further along. I thought my journal would be a good way to share my progress with you. I start out by sketching the roses on with a fine liner brush and thinned paint. I do a very loose sketch of their outer shape and indicate where their centers and bowls will be and which direction they will face. I then paint my roses in solid and wipe back their highlights using a brush and at times a piece of silk wrapped around my finger. Next, I surround the roses with their main leaves and background foliage. At this point in the painting I am concentrating mainly on two things. Keeping the painting soft and smooth and leaving plenty of highlights. In china painting you always have to make sure you don't cover up your highlights. Once they are gone, you can't get them back. White in porcelain painting = the white of the china. I fire this piece hot at around 1465 F so the pink pigment matures properly. Keep in mind this is the first of several fires. Right now it is soft and light. China paints are transparent, so we will build the colors up layer by layer to make them more saturated and to create depth. My first fire is pictured below. For the second fire, it's all about the leaves. I won't be painting the roses this go round. I start out by darkening the deepest shadows. They are found under and in between the flowers, and behind the main leaves. This will help create the focal point of the painting because the eye will be drawn to the deep shadows. Next, I shade the main leaves. There are six in all. Three above the roses and three below. They are the only leaves that will get detail in this painting because they share the foreground with the roses. The other foliage is in the background and will get pushed back using washes (stay tuned for that on a later fire). After shading the main leaves, I wipe back highlights on them to reveal the first fire color and in some places the white of the china. Stems to connect the main leaves are also painted. The background foliage gets some work next. I strengthen the colors by adding more paint to some of the darker areas. Then I carve out a few shapes in the paint with my brush to give the look of stems and leaves with light filtering through them. Here is what the carving looks like. 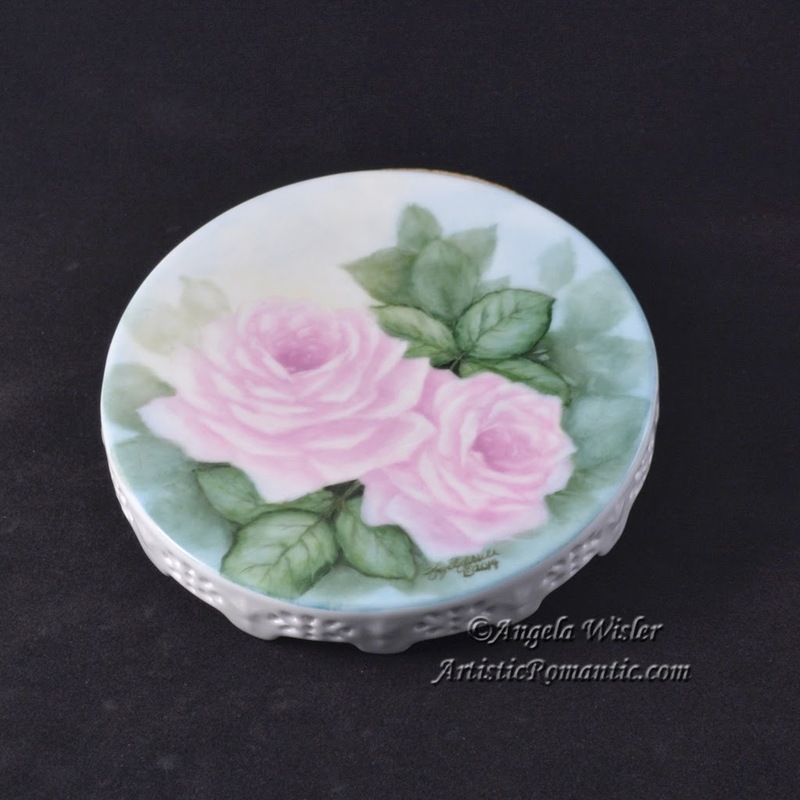 Last thing to do is to make sure my paint is smooth and to check the edges of my roses. I don't want sharp edges all around the roses where they meet the leaves. When the edges are sharp all the way around an object it makes it look pasted on. You want some sharp edges in the focal point area, but too many will make the painting confusing. I fire the second fire just as hot as the first. The second fire painting is pictured below. By the way, I think I like the china photographed against black better than white. What do you think? On to the third fire. I go back to working on the roses. I darken their centers and the shadows between petals. I wash pink paint over them and wipe back their highlights smaller this time to create a middle tone of the pink. Next, I give the main leaves some medium green paint to create a middle value there too. 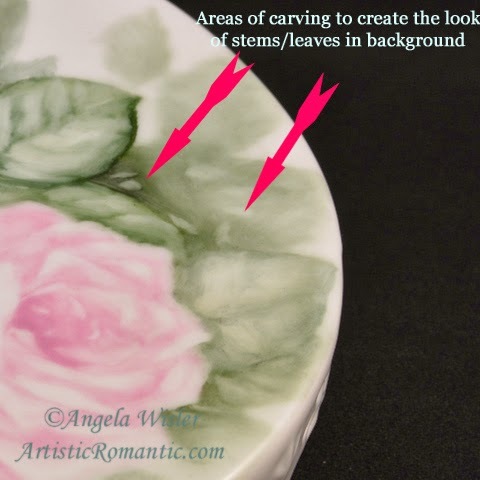 I also deepen the shadows on the leaves where they are under the roses and make sure the edges are not too hard. The third fire is at the same temperature as the other two. The changes appear very subtle between the second and third fire photos. We are nearly done. For the fourth and final fire, I wash blue green paint around the background beginning at the bottom of the design. As I reach the top and left side of the design I filter it out lighter. Then I add just a touch of a yellow wash to the top left of the design to create a light source. 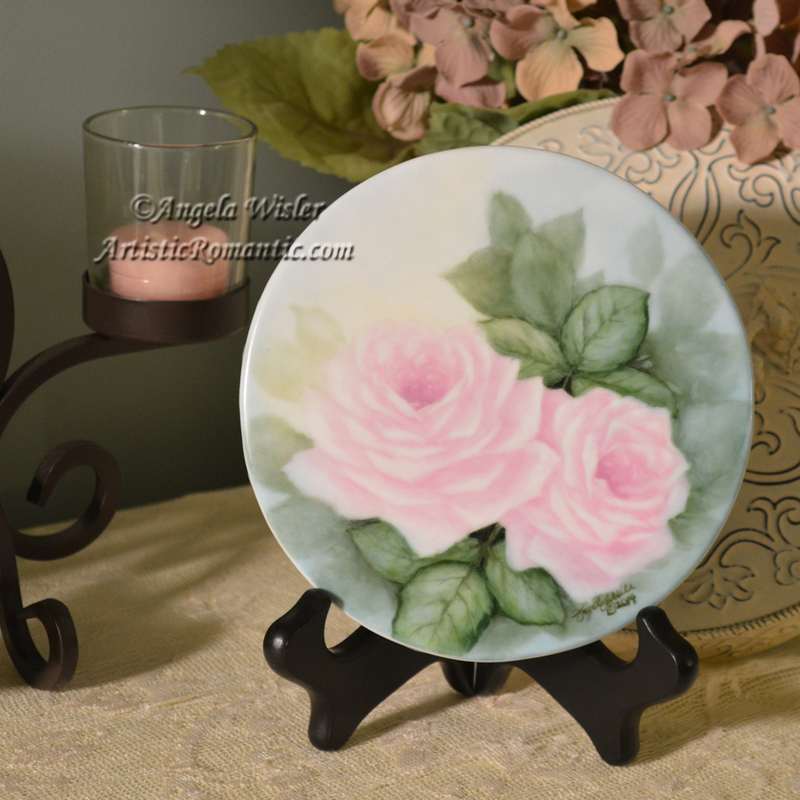 The washes are lightly blended onto the edges of the roses where I want to soften them into the background. Washing the background color onto the roses also helps with continuity in the painting. Next, I add some veins to the main leaves. All that's left to do is to sign my name and it's ready to fire. This last fire I do cooler than the other two. The blue green color does not like a really hot fire so I only go to 1360 F.
The completed piece is pictured below and is currently available for sale in my shop. Thanks for joining me and I look forward to any questions or comments from you. Hi Angela, what a gorgeous painting. Love reading your steps and direction you use. Just simply stunning my talented friend. Thank you for sharing. Thank you, have a great week.